Colin Cowherd has Rams’ left tackle Andrew Whitworth on his show for a lengthy talk about the state of the Rams, Sean McVay, Jared Goff, and more. It’s definitely a nice glimpse behind the blue and yellow curtain. Myles Simmons sees things, five things, Blythish things…and more! The USA Today ranks the Rams where? The radio voice of the LA Rams, J.B. Long dissects Aaron Donald’s 16.5 sacks to reveal the impact and timing of Donald’s conquests. It seems that Aaron Donald is the Robert Horry of quarterback killers. Good stuff J.B! Watch how the Rams got were able to build a delightful corridor for Todd Gurley to turn a short screen pass into a 19-yard reception against the Detroit Lions, brought to you by the mind of McVay! MVP candidate Aaron Donald’s work seems to be really capturing the imagination of media lately. 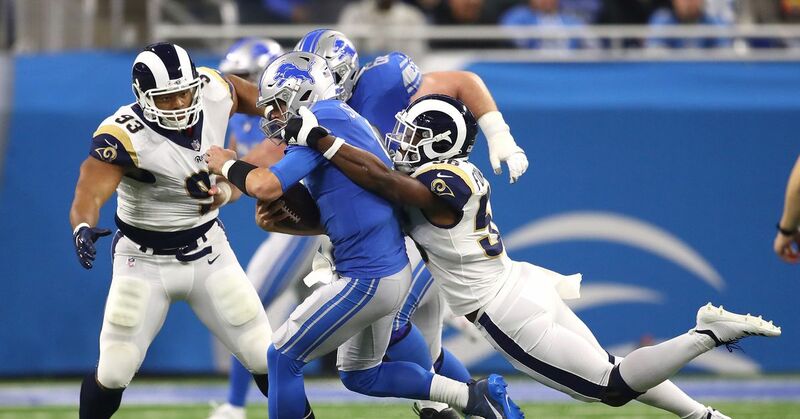 The NFL Network’s Nate Burleson explains why double teaming Rams’ defensive tackle Aaron Donald is simply not enough. Donald and Khalil Mack will be on the same field in five nights from now, and bad men from Clubber Lang to Charles Oakley will be gleefully tuning in. Peter Schrager explains how after this week’s game in Chicago, the Rams will play all their games in warm weather for the next couple months, should they make a playoff run.